When ridden correctly, a long and low frame will engage your horse’s core as well as boost his suppleness. For your horse to feel all the benefits of being ridden in this frame, he needs to be working correctly. He should move forwards freely from your leg into your contact; his back should be raised and supple, and his neck should extend in a light arch from his withers to his poll with his nose just in front of the vertical. Riding long and low isn’t simply riding on a long rein — there still needs to be a connection from your legs to your hands. When you ask your horse to stretch he should remain in balance, engaged and off the forehand. Often horses work best in a long and low frame at the end of a schooling session, when his muscles are warm and he’s on your aids. However, this long and low frame can also be a useful part of warming up, too. As you allow your reins to go longer your horse should follow the bit is being taken forwards, as the horse stretches his head and neck. When he’s stretching correctly he’ll feel powerful, supple and relaxed. If you’re struggling to get your horse to stretch, try the following exercise. This exercise will help work on your horse’s suppleness and encourage him to stretch. 1. 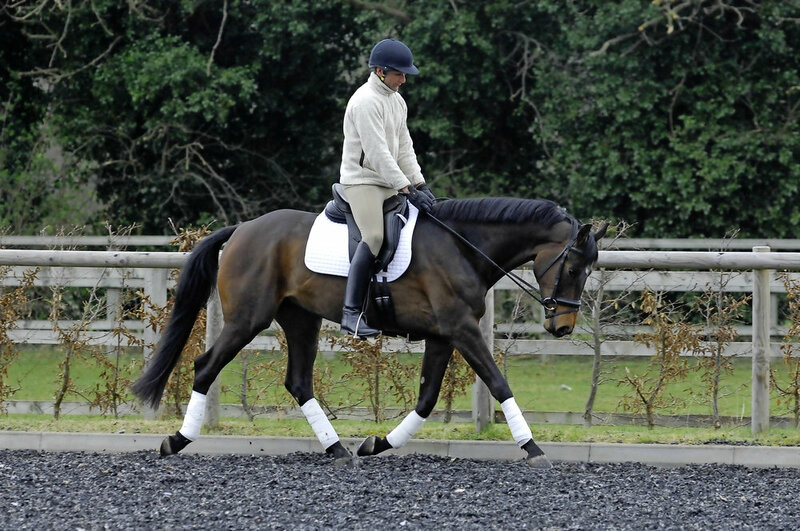 In trot, ride a 20m circle and gradually reduce the size of your circle down to 10m. Remember to create the bend from your inside leg and control the size of your circle with your outside rein and leg. 2. Using your inside leg, ask your horse to move out onto a larger circle. Your outside leg and rein controls how quickly he moves out. Remember to stay in a good, even rhythm. 3. As you return to your outer circle, let your reins become a little longer and see if your horse follows the bit forwards. 4. Use your inside rein to ask for flexion and your inside leg to create the bend. Your outside leg and rein maintain the size of your circle and prevent the shoulders falling out. 5. Maintain this for about half a circle to begin with, before shortening your reins up again.